Bianca Uli Estrada next to her bicycle in Guadalajara. Photo from Estrada's Facebook page. After riding a couple blocks from her home, Bianca Uli Estrada dismounts her bicycle and walks on an unpaved, rocky sidewalk with light posts that split it down the middle. The 26-year-old Estrada feels the wind of oncoming cars and buses as she stops to let pedestrians pass. Earlier this year, a bus smashed and killed someone from the neighborhood, she said, when he fell from his bike trying to squeeze by one of the light posts. “I always feel like I have to kind of like pray, because it’s so scary to ride here,” said Estrada. The cycling community has boomed in Guadalajara in the past few years, with weekly events including RecreActiva, the city’s Ciclovia-styled event, and the monthly Critical Mass ride Paseo de Todos,(or Ride for All). Yet the danger to pedestrians is severe within the Jalisco State, with 98 deaths occurring between January and March. One third of the deaths occurred in Guadalajara (37 deaths). Estrada, a 26-year-old native of Boyle Heights, has lived in Guadalajara since November. Her love for the city and the country goes hand in hand with her growing love to cycle. While the traffic and potholes are constant dangers in the city, it’s also a point of pride that she is able to ride on these streets. When bike mechanic and advocate Joseph-Sandberg “Woody” Woodsin stopped in Guadalajara during his Los Angeles to Guatemala bicycle tour, he met with Estrada and helped her construct her bike. Estrada was riding a road bike, but wasn’t using it a lot because the smaller wheels couldn’t handle the potholes and poor road conditions. She bought a used bike in Tianguis El Baratillo, a weekly swap meet. Then with Woodsin’s help fixed it at La Casa Ciclista, a bicycle collective in Guadalajara. In the end, she only paid 500 pesos, or roughly $50 to fix her bike. In Los Angeles, Estrada has only rode her bike for events hosted by bike groups such as the Ovarian Psycos Cycle Brigade, or for CicLAvia. Her close proximity to her job, only four blocks from her home in Boyle Heights, and the Gold Line made it more convenient for her to use public transportation or walk. 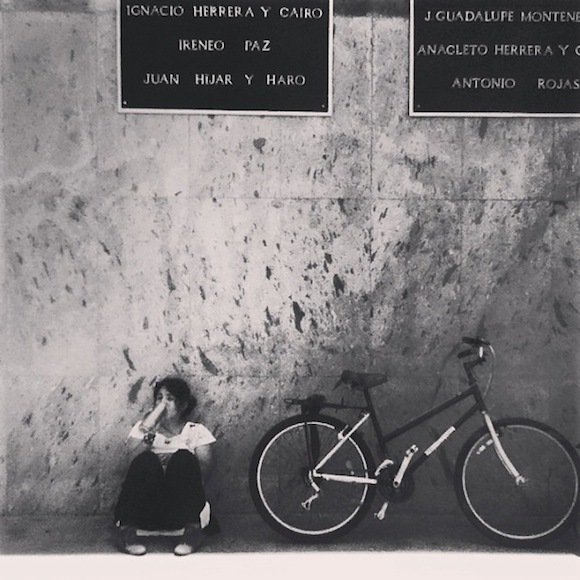 In Guadalajara, she had to choose to either ride her bike or use public transportation. Daily, buses and the metro don’t allow bicycles – except on Sundays the metro allows bicycles for RecreActiva. Choosing her bicycle, Estrada has to plan out her day, and be aware of not just cars and potholes, but even buses. “The bus drivers are maniacs,” said Estrada. A bus one day was gaining behind her, Estrada said, and she had to peddle as fast as she could to get out of the bus’s path. Estrada has met many passionate and creative riders like street vendors that sell ice cream, elote, fruit, plants, and even sharpen your knives right from their bicycles. She has met Bicimaquinas, a collective that works on machines powered by bicycles, and helped them by taking photography and video of them at events. Riding a bicycle in Guadalajara is much more convenient than any other mode of transportation because of how difficult and expensive it is in comparison to bus and car. But most of all, the a risks on the streets keeps her behind her peddles. “Cuz if there’s no risk, no fun,” Estrada said. Bianca Uli Estrada is a member of the photo/video collective Elefante.